Alice Blanche our scheming oujo-sama. 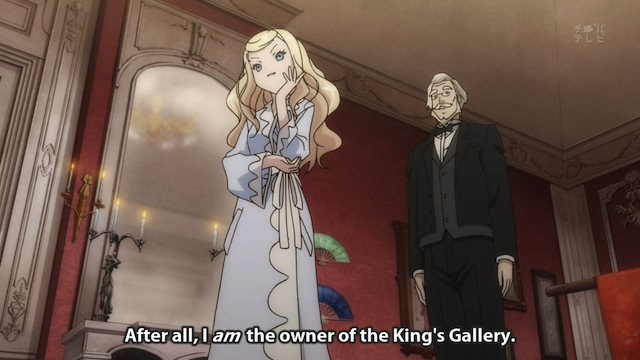 This episode we got a full dose of Alice, the Japanophile that owns the Galerie and Yune’s mother’s kimono. 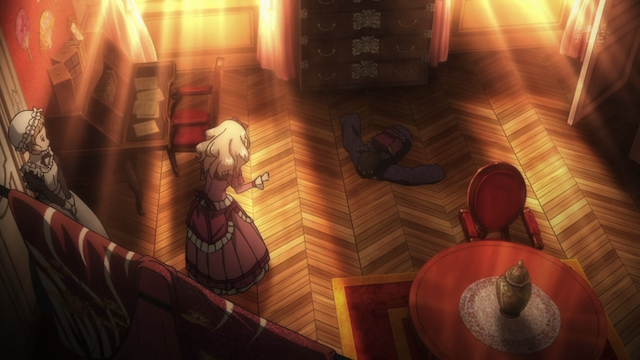 Alice invites Yune to tea, but trys to steal her away forever. 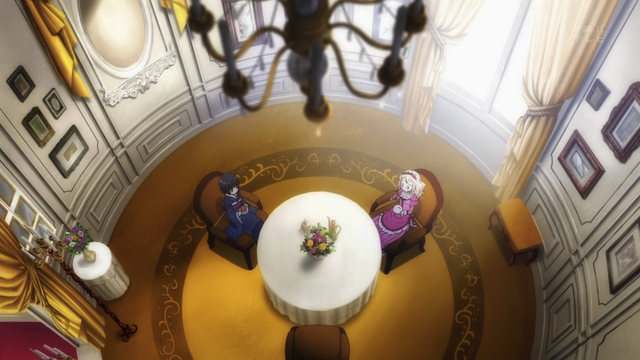 Yune is taken by Alice, as Claude turns his back. Alice turned out to be a pretty lively character. She certainly is as selfish as any oujo-sama, but she has a genuine interest in Japanese culture. She is also played by Aoi Yuuki, who is truly a gifted seiyuu. She really knows how to use her range, as she does here for comedic effect. When Alice is excitedly bubbling about her beloved Orient (or Yune, the cute little Japanese girl), she has a high-pitched tone; let’s call this the “squee voice”. When she gets angry, as in the scene in which she finds out her invitation has been declined, her register drops to a throatier, huskier range. Interesting shot, in an interesting room. Eventually Alice does get Yune back to her place for tea (and a bath), but she also tries to keep Yune for herself. 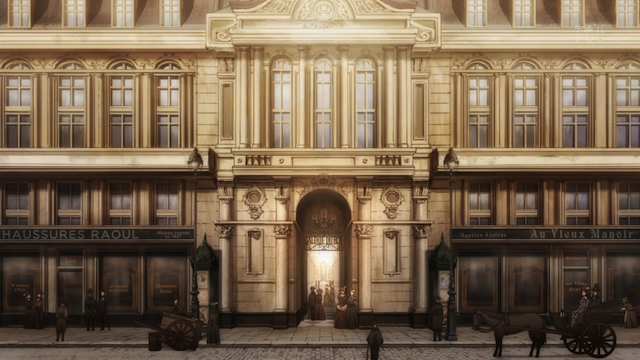 Alice’s selfishness is contrasted with Claude’s selflessness, as Claude recognizes that the Blanche family, with their immense wealth, can provide things for Yune that he and Oscar simply cannot (including regular baths). Speaking of interesting architecture, this week there was some strolling out of doors, which included some impressive background scenery. Alice's older sister, Camille Blanche. 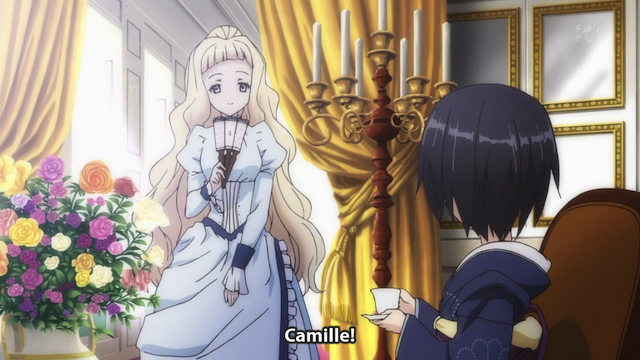 One reason I do not think Alice is hopelessly evil, is that her sister, Camille, seems sweet. I think Alice is just spoiled, not truly a bad person, and I hope that she will become a better person through her encounters with Yune. 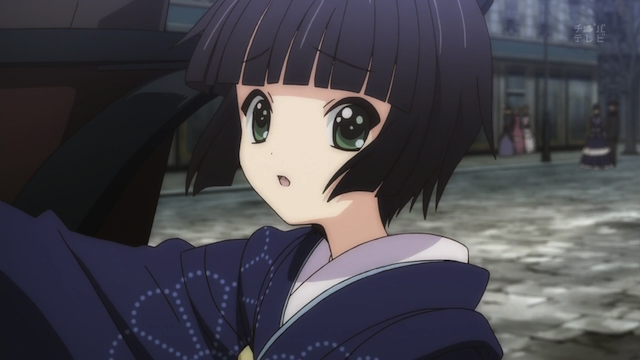 Nevertheless, Alice was acting like a jerk when she tried to use Yune’s mother’s kimono to extort Yune into staying. This lead to the tensest moment in the episode. Even Camille looked on concerned at what her sister was doing. Another reason I believe Alice is redeemable is that she seems to genuinely appreciate Yune, laughing in delight when she meets her, and voicing honest sadness that they have to part. I love the way the light streams in from the windows. There are some great details in this scene. For example, the floor is a beautiful laid wood. The circular table looks like it is made of cherry. You can see an ornate writing desk in the upper left. Even the chest of drawers between the two windows looks mighty expensive. You can’t see it from this angle, but it is topped with items that Alice has collected: a Japanese teapot, and a Japanese doll. Adding Aoi Yuuki to the cast gives this show some added depth, making a show that was already a favorite a real pleasure. It doesn’t look like Alice will be appearing regularly, but I’m looking forward to her next meeting with Yune, as I’m sure she will be better off for it. I was hoping for Alice to become a permanent addition to the cast, but it seems she’ll be little more than a passing side character. Well, they seemed to indicate she would try to meet Yune again, so I think less a “passing” character than a returning side-character. I would like her to be a regular as well, but it doesn’t seem to be happening. The preview from last week DID make it look like that. I’m more pleased to see that it didn’t turn out to be all like that, for Croisee has proved to be a more easy going show despite the clear hardships of the main characters in the story. Yeah, I think she genuinely likes Yune, and that one moment at the end was set up as the major conflict of the episode. I like it better without a real “villain” too. As you say, the characters are facing their hardships, which makes it a very positive show.